AV Installs provide expert custom audio visual solutions for the corporate industry, from reception areas to video walls and multimedia boardroom presentation systems. 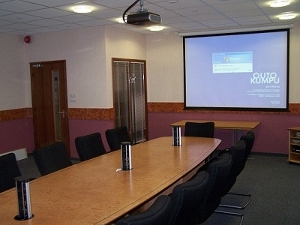 AV Installs understands that importance of audio visual display and presentation equipment in the modern corporate enviroment, long gone are the drywipe boards and flipcharts. AV Installs has a long history and excellent track record in providing solutions that are designed to meet clients needs, technical ability and budget requiements. With so many different products and manufacturers on the market sourcing an effective AV solution for your office can be a daunting task. AV Installs offers a on site survey with this service where our expert engineers will arrange a consultation with customers to discuss thier Audio Visual requirements and offer protential solutions. This visit will also give our engineers and opportunity to asses the site for protential installation solutions and hazards. Once we have a clear picture of our clients needs and expectations we will produce a written consultation along with all relevant supportive information for the hardware suggested. Popular prouducts and services for the corporate industry.